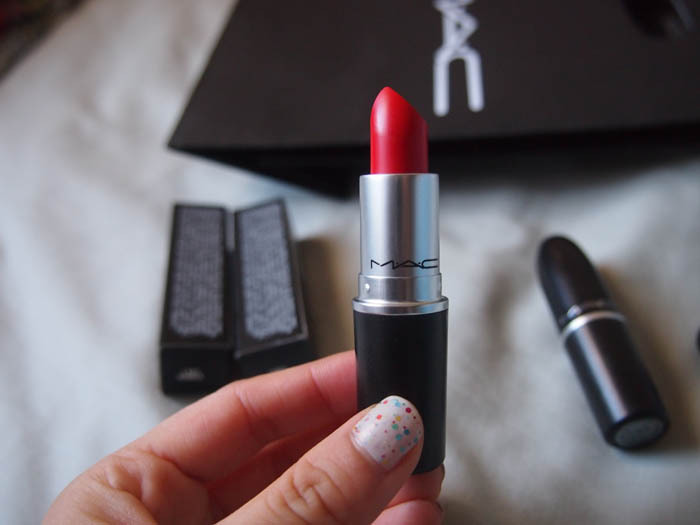 cheriepy's blog: M.A.C Lipsticks Mini Haul! Lydia 'volunteered' to help me buy some M.A.C lipsticks when she went to visit Hawaii... back in May/June 2015. She has since decided to go back to visit yet again in December 2015 and I was wondering whether or not I should ask her to buy a few more lipsticks for me (I have my eyes on Velvet Teddy and Morange aarrggghh). But I didn't as I already have quite a few lipsticks. 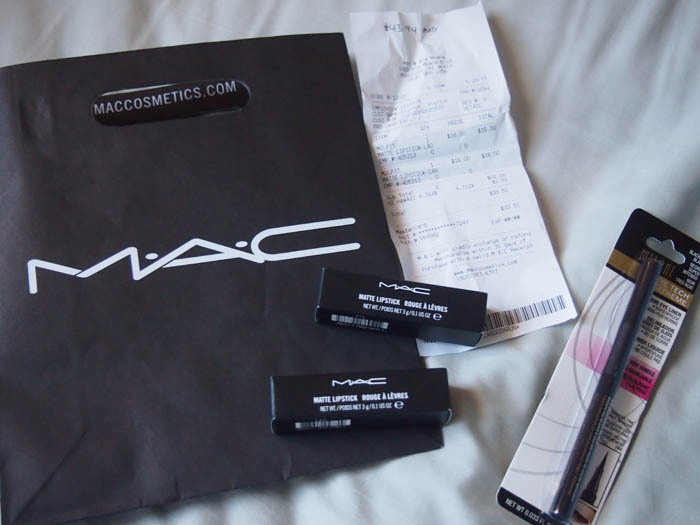 Previously, I did not really have any M.A.C items except for two lipsticks from the 90's that don't exist in the current line. They are so old that the packaging is different. Anyway, I was really glad I got the colours I got. M.A.C in general is a lot cheaper in the United States than in Australia even with the terrible AUD at the moment. From the receipt, each lipstick was 16USD (without tax) which was equivalent to 22AUD in May/June 2015. A M.A.C lipstick in Australia costs 36AUD. Lady Danger (Matte) because I wanted a red lipstick. I swatched all of the famous reds including Ruby Woo (Retro Matte formula is way too dry for me), Russian Red (I didn't particularly like the blue tones in the red which made it so dark), Red (I didn't think this colour suited me so well). Lady Danger suited me the best as I look good with orangey coral reds. I haven't started using this lipstick yet! 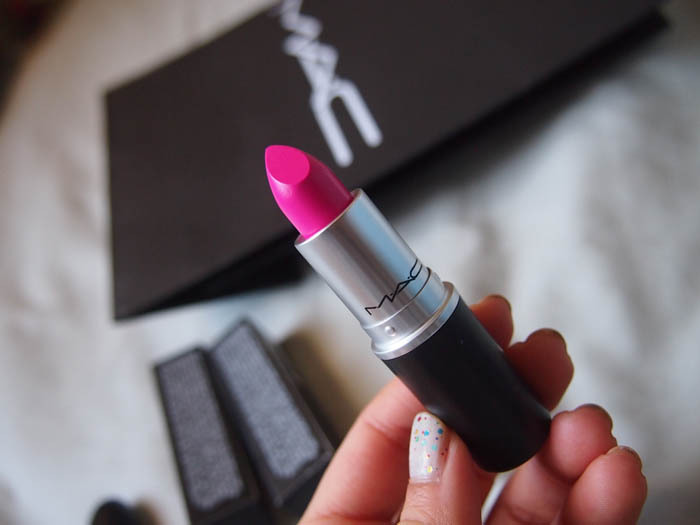 Candy Yum Yum (Matte) because even though pink is not one of my favourite colours, I think it looks really beautiful as a cheek or lip colour. It was a cooler tone version of NARS Schiap for me and it reminded me of IOPE's Water Fit Lipstick in #44 Forever Pink. I thought this colour looked really flattering (surprisingly) as a gradient lip but not so much as a full lip on my already thick and occasionally dry lips. I've already used quite a bit of this lipstick. I'm really glad I got these two colours and not Miley's Viva Glam lipstick as I already have a similar lipstick colour. However, I do like that sales for that lipstick goes to a good cause. Bonus: Milani Eyetech Extreme Eyeliner in Black because Lydia insisted it was the best eyeliner and she went to several Ultas to track it down for me as an extra present:) Haven't tried it yet as I was using Dolly Wink and now CLIO. Christina also got me a CLIO eyeliner as a present in December 2015.